Clicking on any link below will open that link in a new window. Orange Belt Mineralogical Society - San Bernardino"
John Betts - Fine Minerals, New York, NY on-line gallery of mineral and crystal specimens. 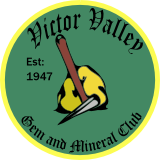 Lifestyle Store -Your one stop source for the rock collector, gold prospector and treasure hunter. Women in Mining - Excellent Activity Page ! Explorations for Kids - Rocks and Minerals - Guide to the best and most interesting and useful sites and articles about home education on the web.